Wood is probably one of the most popular and sought-after materials for cigar humidors. As such, they are also the most commonly available, which can make choosing one very complicated. 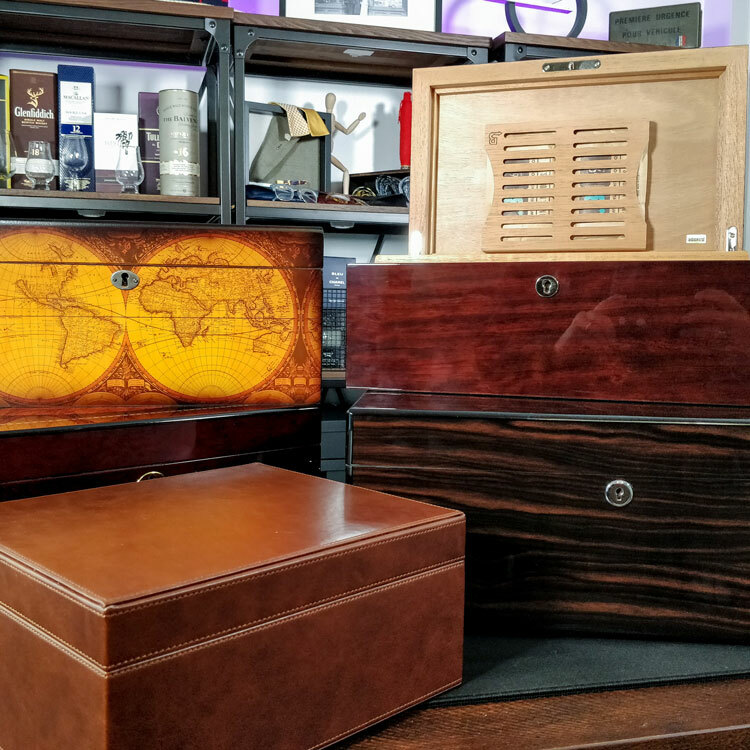 As such, we have established this detailed guide on not only the Best Wooden Humidors but also their advantages and drawbacks as well as the maintenance they require. Why Buy A Wooden Humidor? You can use the links above to jump ahead. You can also head to the menu below to learn more of what we cover in this guide. What Are The Best Wooden Cigar Humidors? Firstly, let’s begin to explore why you might want a wooden humidor in the first place. Although we’ve already explained the need for a humidor in our introductory guide, there are lots of options available that aren’t necessarily made from wood. 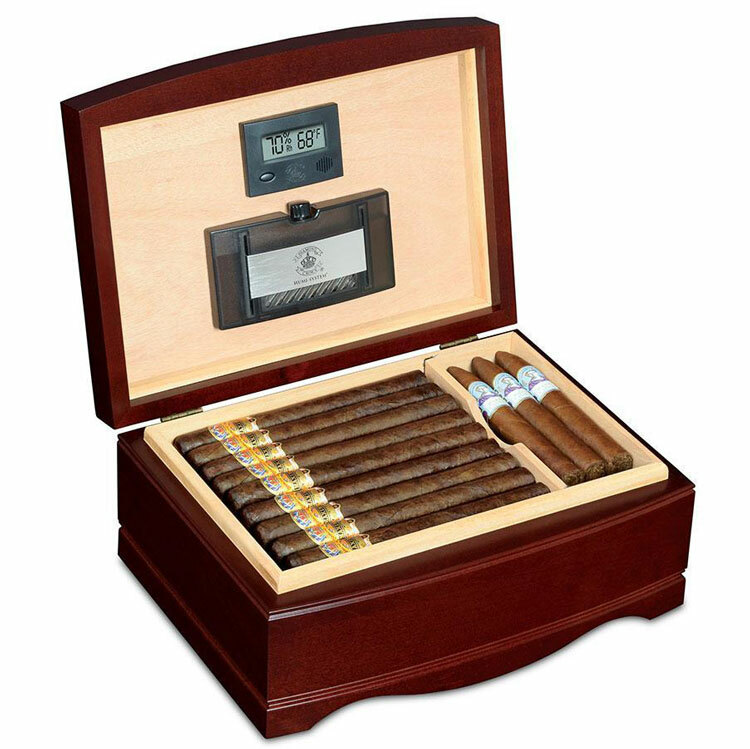 Nevertheless, wooden humidors continue to be the most popular among the majority of cigar enthusiasts. However, this doesn’t necessarily make them the best choice for various reasons. For instance, we’ll explore later that they do require some work and there are lower-maintenance humidors to buy instead. That said, wooden humidors are by far among the most decorative that you can own and this is likely greatly contributes to their popularity. Being made from noble materials, they’re quite ornamental and can be embellished with rich designs and finishes. As such, they’re an attractive purchase as they don’t only just store cigars but they’re also a decorative addition to your home. With many being made in China, they are can also be surprisingly affordable. 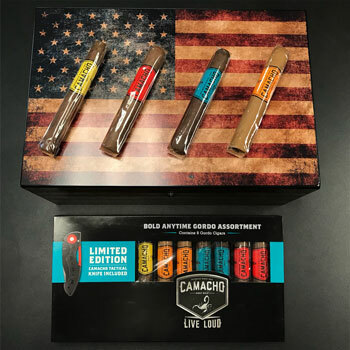 Meanwhile, those with greater means can instead opt for more premium humidors notably made in the USA and France that use exotic wood and skilled craftsmanship. As mentioned above, a wooden humidor tends to be the most pleasant storage solution to own. Depending on the design, it can either seamlessly blend in with a room or even be used as a centrepiece. Aside from decorating your lounge, study, office or man-cave with a traditional ornament, there are other benefits to wooden humidors too. Firstly, a quality wooden humidor is very sturdy and can last for generations if properly maintained. Like antique furniture, it can be kept as an heirloom and passed down the family. Of course, this may not be the case of a Chinese-made humidor. However, these can last a very long time too. Unlike cigar coolers that use electronics and mechanical parts, they won’t break down. Similarly, they won’t perish, which may eventually happen with even the best tupperdors and coolidors. Secondly, wooden humidors offer very solid storage that may be safer than other storage solutions. While coolidors can break under pressure or weight, coolers are inherently fragile due to the use of glass. Indeed, wood isn’t invincible but it can certainly take a beating before it breaks. Finally, a proper wooden humidor should be lined with Spanish cedar. Sometimes humidors can be lined with American red cedar or Honduran mahogany. However, these don’t provide you with the same benefits. Why Is Spanish Cedar Important? Spanish cedar is one of the most moisture absorbant types of wood. Therefore, it can act like a membrane inside the humidor and help ensure consist humidity. When the humidity is too high, it will absorb more moisture. Meanwhile, it will release moisture when it begins to drop. Furthermore, Spanish cedar has a mild yet pleasant scent. Many enthusiasts enjoy the aroma when opening a wooden humidor but the cedar can also positively impart a little flavour into the cigars themselves. Finally, cedar is known as a natural insect repellent. This is why it’s often used in wardrobes to keep moths at bay. Similarly, a Spanish cedar humidor lining will help in preventing tobacco beetle or worm infestations. Although wooden humidors do have their advantages, they are far from perfect. Firstly, the greatest inconvenience of wooden humidors is that they’re quite high maintenance. As mentioned above, wooden humidors are indeed relatively high maintenance compared to other storage solutions. Given that wood is a natural material, it requires seasoning before its first use. This ensures that the wood is properly hydrated when your cigars are introduced. If the cigars are introduced into a dry humidor, the wood will absorb the humidity from the cigars and cause them to dry. Wooden humidors will require regularly maintenance to prevent the humidity from dropping. This requires both attentiveness and regular seasoning events as we’ll talk about later. Wood is also very sensitive to humidity in general and it can easily be affected by its environment. As such, areas with low or high humidity may affect its performance. If you live in a particularly dry climate, you’ll need to compensate with a superior humidifier and regular seasoning events. Meanwhile, humid climates require you to be careful that the humidity isn’t too high. Owners of wooden humidors need to be vigilant as the relative humidity inside the humidor may oscillate during different seasons. They also need to be careful on how much they humidify the interior. If it is over-humidified, the wooden seal will expand and make it hard to open. Meanwhile, if it is too low, the wood will eventually try to absorb the the moisture from the cigars themselves. Similarly, the local humidity can also affect the humidor’s seal. As wood expands or contracts depending on its level of moisture, dry seasons may weaken the seal too. As mentioned above, wood is generally sensitive to humidity. Therefore, wooden humidor owners should be careful that their humidors are well-maintained. Spikes and drops in humidity can damage the wood and eventually cause it to crack, which will undermine the seal entirely. Finally, the size and bulkiness of a wooden humidor is desirable for some but can be an inconvenience for others. They’re very hard to transport and are effectively made to be kept in the same place all the time. If you’re short on space, this can be a pain as they’re hard to move around and can’t be easily tucked away somewhere out of sight due to their size. Although the list of drawbacks is long, that doesn’t mean that they outweigh the benefits. After all, wooden humidors continue to be the most popular choice among cigar smokers for good reason. Nevertheless, it’s important to be fully aware of their needs and the commitment involved. When buying a new wooden humidor, we do have some advice. Some of the tips that we offer may seem obvious but they’re important to keep in mind nonetheless. Firstly, make sure that you’re buying a humidor that features a Spanish cedar lining at the very least. As described above, there are many benefits to Spanish cedar and it’s the greatest advantage of owning a wooden humidor. Secondly, make sure that you invest correctly in buying a quality humidor. Choosing a cheap one just because it looks attractive and is more affordable undermines the purpose of the humidor in the first place. After all, cigars are expensive and purchasing a humidor should be an investment that’s proportional to your collection. Cheaper humidors may be made from inferior wood with poor construction that will affect its hermetic performance. Consider seeking out reputable brands or relying on recommendations for experienced cigar enthusiasts. This will help you avoid the same mistakes that they likely made in their learning journey. Although glass top humidors have the benefit of being able to admire your collection or check the readings of any devices inside, they have their own problems. Glass top humidors, especially cheap ones, tend to have very poor seals and let a lot of moisture escape. Similarly, the glass top may provoke a greenhouse effect under the sun, which may cause the contents to heat up. Cigars closest to the glass are the most vulnerable as they won’t only lose humidity but may be exposed to direct sunlight. This can cause them to lose their colour as well as their flavour. Whatever devices come with your new humidor, be prepared to throw them away and replace them with something else. Firstly, many wooden humidors continue to be supplied with analogue hygrometers. These are well-known for being inaccurate even after calibration. Therefore, be sure to buy a quality digital hygrometer to use instead. Unfortunately, most analogue hygrometers are built into the humidor’s facade and can’t be removed. Still, they can act as a decorative part of the humidor but shouldn’t be relied on for readings. Similarly, the humidifiers supplied with humidors are rarely effective. Most cheap humidors are supplied with floral foam in plastic or metallic cases. They take up a lot of space and work poorly at best. Consider replacing these immediately with a high quality humidifier that offers a two-way moisture exchange. We’ll soon offer a guide on humidification and the best devices to buy. Finally, it’s always worth buying a larger humidor that the size of your current or future collection. This makes sense for several reasons. First, you’ll be making a long-term investment that avoids you having to buy another humidor as your collection grows. As such, you won’t have to spend more in the upcoming months or years and repeat the whole seasoning process. Secondly, it’s important that the humidor’s contents aren’t cramped. Forcing too many cigars into a humidor can not only damage your collection but it can prevent air circulation. If there isn’t enough room in the humidor, the humidity won’t be evenly distributed throughout its contents. This may cause some cigars to become over-humidified while others begin to dry out because the moisture can’t reach them. As mentioned above, wooden humidors require some care to keep them in proper working order. Before you can even use a new wooden humidor, the wood must be seasoned first. This is essential as new wood is quite dry, it will absorb any moisture to which it is exposed. If this is overlooked and cigars are placed in the humidor immediately, the wood will absorb their moisture. This is counterproductive and can actually permanently damage your cigars. Learn how do this properly and effectively with our wooden humidor seasoning guide. Seasoning a humidor should become a habit and be undertaken every year for the first four years. After that, wooden humidor owners need to keep a watchful eye on the hygrometer. If the humidity begins to drop inside without any explanation, it may provoke what is known as a “seasoning event” where you must do it again. Sometimes this may be caused by seasonal changes in drier climates. However, it may be because the humidor has a weak seal. Unfortunately, wooden humidors are sensitive apparatus that require regular care. As such, they can’t just be left to function on their own. Even very occasional cigar smokers are encouraged to check their humidor regularly. Keeping a watchful eye on your humidor ensures that you can intervene should the humidity or even the temperature begin to fluctuate. If you neglect your humidor for too long, you miss any changes, which can affect the long-term health of your cigars. Awarded by Cigar Aficionado as the best humidor to buy, Daniel Marshall’s prestigious creations have been made in California since 1982. Featuring a digital hygrometer and the brand’s signature humidifier, it also includes 24kt gold-plated hinges, black ebony edging and a Spanish cedar interior. The burl Private Stock humidor is available in either a 100 or 125 count size. Although they’re somewhat pricey, we’d go for the larger of the two for better circulation and to avoid a cramped collection. Handmade by Amish craftsman in Rhode Island, the American Chest Company is a fascinating brand. Own By David “Mac” McLoughlin, it neatly fills the void left by Reed & Barton when their production moved to China. With US-made quality being their philosophy, the American Chest Company humidors are only made from hardwood. They also feature an invisible magnet in the lid so you can attach your devices directly. Although made in China, Diamond Crown offers some of the best made wooden humidors on the market. Owned by J.C. Newman Cigar Co, there is a singular endeavour to provide relatively affordable quality. The Alexander humidors from the St James series feature a ebony veneer over the Spanish cedar frame. The lid has an in-built magnet so you can fix either your own or the supplied hygrometer and humidifier. Quality Importers is a leading brand for affordable humidors. While they’re not the most premium in terms of materials, they do offer excellent quality. 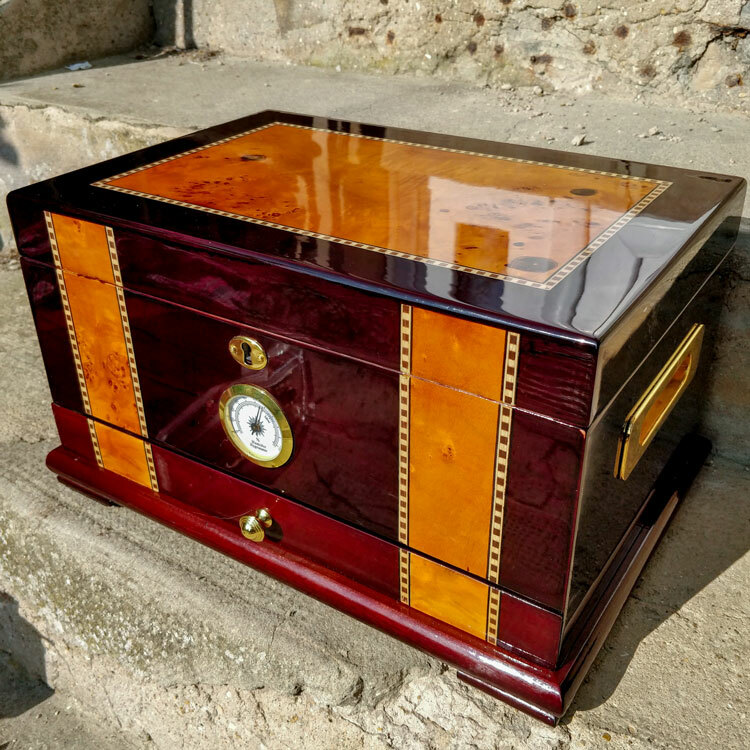 The Bespoke Unit team has relied on the Old Glory humidor for many years without ever being disappointed. The Spanish cedar lining has been kiln dried and the humidor uses the brand’s SureSeal technology to prevent humidity loss. Its weathered US flag exterior is very attract and resistant to wear. While it does come with an analogue hygrometer and foam humidifier, we quickly replaced these. Another favourite used by the BU team on a daily basis, the Habanos & Hermanos Classic Collection humidor is a spacious and elegant number. Its high gloss African ebony and Birdseye maple finish is beautiful and looks great in any environment. Meanwhile, the tray underneath is great for storing accessories and spare humidity devices. While the analogue hygrometer is best left for decoration, there’s plenty of space for a digital one inside. Similarly, we removed the humidifier in favour of a Boveda mounting plate. If you’re looking for a humidor that’s very easy to organise, we were blown away by the customisation offered by the Adorini Genova Deluxe. A cleverly-designed humidor, it offers numerous partitions that can be labelled for easy organisation. You also have a ribbed interior that not only improves circulation but lets you set the height of the interior shelf. We were very fond of this humidor and its construction. However, it’s admittedly somewhat pricey. Nevertheless, the benefits do justify the cost. The Salvador is a very large desktop humidor but sits low enough for easy access. We love the contrast between the Brazilian rosewood and polished metal feet. Like the more premium humidors, there’s a magnetic backing in the lid for easy installation of your devices. While the digital hygrometer is quite reasonable, we would replace the humidifiers with a 320g Boveda pack. This great little humidor exceeded expectations with its surprisingly solid construction. Most cheaper humidors tend to be made with inferior materials such as MDF or cardboard bases. However, the Megacra was very solid and offered great overall performance. No hygrometer is supplied with this one and the humidifier is pretty poor. Throw it out and you’ll be fine with just a 60g Boveda pack. Reviewed by Arnold T., on 19th October . "Really helpful guide! Absolutely fantastic guide and a great help for novices like myself."